My family owns a lot of Kindles – yes, a lot of them. Don’t ask me why. Probably because we loved the first Kindle and then kept on piling a new one without getting rid of the old ones. We ended up having lots of them – we have almost all the Kindle variants available in the market. Our favorite ones are Kindle Paperwhite and Kindle Fire HD. We decided to gift a few of the old Kindle and decided to wrap them in new covers. So, I went through a lot of covers. You will see my feedback on all the ones I carefully examined. Today is the turn of Kindle Paperwhite Leather Review. Amazon Kindle Paperwhite Leather Cover design is very similar to the Amazon Kindle Touch Leather Cover. It secures firmly to your Kindle and is a great way to keep your Amazon Kindle in the cover all the time. It has an area cut out at the bottom for the power button and the charging port. The front of the cover is leather, but this time it has a cross-cut textured pattern in it. It looks fairly stylish, and this is an improvement over the Touch cover, which showed scratches and pits in the leather very easily. Additionally, the cover is designed to fold back, so reading with one hand continues to be the feature of Amazon Kindles. 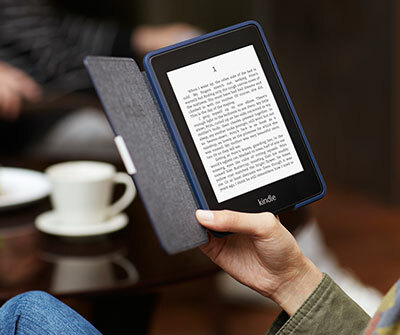 Amazon Kindle Paperwhite leather cover was designed by Amazon to be the lightest and thinnest protective cover for Kindle Paperwhite only. It will not fit Kindle or Kindle Touch. It has a magnetic clasp, which ensures cover is securely closed and it can wake or put your device to sleep when you opening or close the cover. Amazon Kindle Paperwhite leather cover is available in 7 different colors to match your style. Kindle Paperwhite leather cover feels good in your hands and compliments the reading experience with your Paperwhite. As I type this review, the price of this cover in any color is $39.99, which is a pretty good deal when you compare it to the pricing of the covers for other models of Kindle. I would highly recommend this one in the color of your choosing – you want to protect your investment. I don’t have to think twice before giving the Kindle to kids.